Last week, we wrote about three key items that make “local” marketing a standalone objective that businesses should pay special attention to. We covered the importance of getting listed, best listings management practices, and how to keep a great online reputation. Once you have your ducks in a row, what happens next? It’s time to optimize: generate data from your listings, capitalize on social media (especially user generated content), and, lastly, keep yourself sane by managing it all in one central hub. Miss part one of the series? Read it here. Every marketer knows that data-first thinking will lead your brand in the right direction. This is paramount for your local marketing campaigns. Using data and analytics that tells you who’s searching for your stores, how they found you, where they’re coming from, and how they’re converting, will help you make informed targeting decisions on a per-location basis. Harvesting insights for campaigns with this method will help you win out over your nearby competitors. Example: You’re a brand with 150-locations. You notice that searchers end up on your local listings through Adwords keywords “best shoe store” in your urban locations. However, in rural areas, your listings are getting barely any search volume. What does this tell you? Your demographic in rural areas might be looking for something more specific than just “shoe store.” Perhaps you should try bidding on a particular product instead. While you’re at it, make sure your local listings are updated and optimized in the underperforming areas, too! Social proof, people! One of the main reasons social media has become so entrenched — and addictive — in our everyday lives is the idea of “social proof.” Social proof, in brief, is a psychological concept that concedes humans assume the actions of others to behave in a seemingly appropriate and “socially accepted” way. Social media has become a key platform for expanding the horizons of social proofing. When you combine this with the hyper-localized direction social media is going, you have a match made in marketing heaven. The emergence of geo-locations, geo-filters and location-based social sharing enhances the localized element of this phenomena. 3. Learn How to Manage it All — And Stay Sane! Ask any company’s marketing team how they’re doing it, and chances are you’ll hear that they’re overwhelmed and overworked, trying to manage several different company objectives under one big marketing umbrella. Great tools, for marketers (and companies at large), are meant to streamline activity and keep it as convenient — and efficient — as possible. 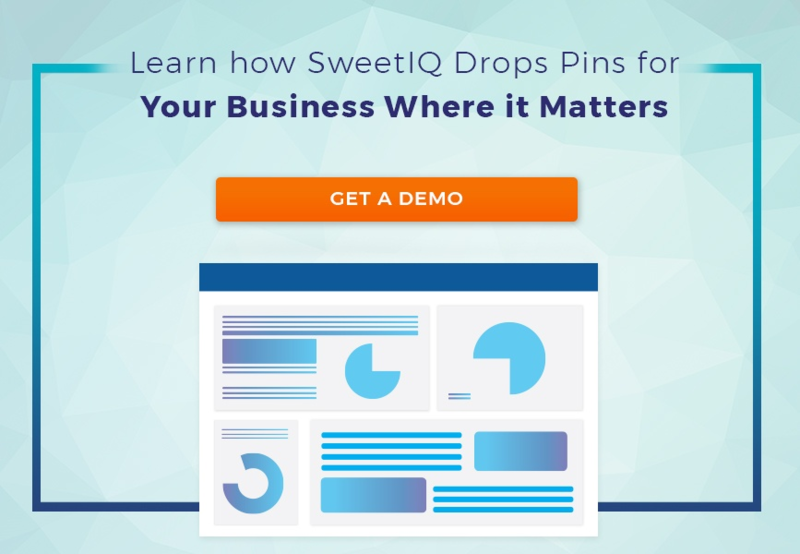 SweetIQ’s Local Marketing Hub is the ideal tool to execute all local marketing activity. Manage all of your listings, get actionable analytics, measure success on a per-location basis, all in one place. Example: You have a team taking care of brand development, another taking care of social media, plus online advertising and client relationship management. When you examine who can take on the local marketing realm, you realize there isn’t a spare minute in anyone’s day. A local marketing platform and a dedicated team of experts will get the job done for you — so you can win the local game over your competitors, and keep your day-to-day as manageable as possible. It’s a win-win.